Excuse me for not writing for such a long time. I have been roaming about here and there and have no time as yet and so I find it very difficult to write. However I have been following you in your touring and your work and am with you in thought and prayer. I am longing very much to see you so please do inform me if you are coming to Madras. There is some talk about it, I hear, and I am sure we need you very earnestly here. Probably I shall still leave Madras tonight and as soon as I get a house, I shall write a long letter to you. Thanks for the money (Rs. 150) which l here return. I also owe something for cloth. Please ask the officer to send me my Bill and I will pay it off. I find it very difficult to get real swadesi cloth in Madras or these parts of India and I am going to use only Indian things as far as possible hereafter. With my kind regards to Mrs. Gandhi, Devadas and all other friends in the ashram and with you. Mrs. Billman* sends her kind regards. Source: The National Gandhi Museum. I was delighted to hear from you after a long absence. As soon as I heard that you wanted Miss Faering to join you during Xmas, I had no hesitation in saying that she should respond to your wish. I can thoroughly appreciate the Christian sentiment that friends and relations should gather together and have sweet communion during the Xmas season. I must confess to you that Miss Faering's presence in the Ashram is uplifting for us all. She is such a good-natured loving girl with all the loftiest aspirations that anyone can be capable of. We are looking forward to meeting her again. I only wish that she will be able to keep her health here and become a better and a stronger Christian for her presence in the Ashram. As I have so often told her, her living at the Ashram can be justified only if she not only retains undiminished her Christianity but that, in the environment of the Ashram, it becomes purer and more ref[ined] than ever before. I consider my self a Hindu of Hindus. I believe that I have a fine perception of the truth of Hinduism and the priceless lesson I have learnt from it is that I should not wish that others may become Hindus but that they become best specimens in their own faith. I hold an unfortified day cast in your lot with me here. Let not the Indian summer frighten you. I can easily arrange for you to pass the two hottest months of the year in a cool place. There are many such in India. They are not inaccessible. I commend to the attention the readers of Young India the thoughtful letter received from Miss Anne Marie Petersen. Miss Petersen is a lady who has been in India for some years and has closely followed Indian affairs. She is about to sever her connection with her Mission for the purpose of giving herself to education that is truly national. I have not given the letter in full. I have omitted all personal references. But her argument has been left entirely untouched. The letter was not meant to be printed. It was written just after my Vellore speech. But it being intrinsically important, I asked the writer for her permission, which she gladly gave, for printing it. I publish it all the more gladly in that it enables me to show that the movement of non-co-operation is neither anti-Christian nor anti-English nor anti-European. It is a struggle between religion and irreligion, powers of light and powers of darkness. It is my firm opinion that Europe today represents not the spirit of God or Christianity but the spirit of Satan. And Satan's successes are the greatest when he appears with the name of God on his lips. Europe is today only nominally Christian. In reality it is worshipping mammon. "It is easier for a camel to pass through the eye of a needle than for a rich man to enter the kingdom." Thus really spoke Jesus Christ. His so-called followers measure their moral progress by their material possessions. The very national anthem of England is anti- Christian. Jesus, who asked his followers to love their enemies even as themselves, could not have sung of his enemies,"Confound his enemies, frustrate their knavish tricks'. The last book that Dr. Wallace wrote set his deliberate conviction that the much vaunted advance of science had added not an inch to the moral stature of Europe. The last War however has shown, as nothing else has, the Satanic nature of the civilization that dominates Europe today. Every canon of public morality has been broken by the victors in the name of virtue. No lie has been considered too foul to be uttered. The motive behind every crime is not religious or spiritual but grossly material. But the Mussulmans and the Hindus who are struggling against the Government have religion and honour as their motive. Even the cruel assassination which has just shocked the country is reported to have a religious motive behind it. It is certainly necessary to purge religion of its excrescences, but it is equally necessary to expose the hollowness of moral pretensions on the part of those who prefer material wealth to moral gain. It is easier to wean an ignorant fanatic from his error than a confirmed scoundrel from his scoundrelism. This however is no indictment against individuals or even nations. Thousands of individual Europeans are rising above their environment. I write of the tendency in Europe as reflected in her present leaders. England through her leaders is absolutely crushing Indian religious and national sentiment under her heels.England under the false plea of self-determination is trying to exploit the oilfields of Mesopotamia which she is almost to leave because she has probably no choice. France through her leaders is lending her name to training cannibals as soldiers and is shamelessly betraying her trust as a mandatory power by trying to kill the spirit of the Syrians. President Wilson1 has thrown on the scrap-heap his precious fourteen points. * The original letter is missing. I cannot thank you enough for your kindness and the way in which you received me and I feel that meeting more or less decided my future. I have thrown myself at the feet of India. At the same time I know that in Christ alone is my abode and I have no longing and no desire but to live Him, my crucified Saviour, and reveal Him for those with whom I come in contact. I just cling to His feet and pray with tears that I may not disgrace Him as we Christians have been doing by our behaviour in India. We go on crucifying Christ while we long to proclaim the Power of His resurrection by which He has conquered untruth and unrighteousness. If we who bear His name were true to Him, we would never bow ourselves before the Powers of this world, but we would always be on the side of the poor, the suffering and the oppressed. But we are not, and therefore I feel myself under obligation not only to Christ but to India for His sake at this time of momentous importance for her future. Truly it matters little what I, a lonely and insignificant person, may say or do. What is my protest against common current the race to which I belong is taking and (what grieves me more), which the missionary societies seem to follow? Even if a respectable number protested it would not be of any use. Yet were I alone against the whole world, I must follow my conscience and my God. I therefore cannot but smile when I see people saying you should have awaited the decision of the National Congress before starting the non-cooperation movement.1 You have a message for the country, and the Congress is the voice of the nation - its servant and not its master. A majority has no right simply because it is a majority. But we must try to win the majority. And it is easy to see, that now the Congress is going to be with you. Would it have done so if you had kept quiet and not lent your voice to the feelings of the people? Would the Congress have known its mind? I think not. I myself was in much doubt before I heard you. But you convinced me. Not that I can feel much on the question of the Khilafat. I cannot. I can see what service you are doing to India, if you can prevent the Mahomedans from using the sword in order to take revenge and get their rights. I can see that if you unite the Hindus and the Mahomedans, it will be a master stroke. How I wish the Christian would also come forward and unite with you for the sake of their country and the honour not only of their Motherland but of Christ. I may not feel much for Turkey, but I feel for India, and I can see she (India) has no other way to protest against being trampled down and crushed than non-cooperation. I also want you to know that many in Denmark and all over the world, yes, I am sure every true Christian, will feel with and be in sympathy with India in the struggle which is now going on. God forbid that in the struggle between might and right, truth and untruth, the spirit and the flesh, there should be a division of races. There is not. The same struggle is going on all over the world. What does it matter then that we are a few! God is on our side. Brute force often seems to get the upper hand but righteousness always has and always shall conquer, be it even through much suffering, and what may even appear to be a defect. Christ conquered, when the world crucified Him. Blessed are the meek; they shall inherit the earth. When I read your speech given at Madras212 it struck me that it should be printed as a pamphlet in English, Tamil, Hindustani and all the most used languages and then spread to every nook and corner of India. The non-cooperation movement once started must be worked so as to become successful. If it is not, I dread to think of the consequences. But you cannot expect it to win in a day or two. It must take time and you will not despair if you do not reach your goal in a hurry. For those who have faith there is no haste. I shall not tire you by writing a long letter to you. I would have written and would have run to you at once if it had not been for this very reason.1 For is it not selfishness the very craving of one’s heart wanting to see you? You know I am sure that in my prayer and my thoughts I am always with you. I also thought it would be better to wait and see you later – but I am now afraid that they will take you from us again and if it is [not] only a botheration for you if my visit could in any way a love offering to you I shall come to Poona. I am glad however that Kuhni2 has seen you and that Esther has started with her little girl today. They will be there about the time you get this letter. Give them your blessing and it is enough for me. In God’s own good time I also will be allowed to meet you again. May God strengthen you day by day and help us all to fight the good fight and win the prize. 1 Gandhi was then recuperating in Yeravda prison, Poona, after an operation for appendicitis. I send you this as a token of my love and prayer.1 Not that I have not spun more in all these days. I have. I am trying to do my duty. But this cotton is Devacotton,2 cannot not be used by man and therefore it is for you. It was grown in my garden. I plucked it early in the morning when the white soft little cotton children were wet with dew, tears shed from above for our sake. I took the offering, spun it from the seed so that no machine should crush and soil it. I have prayed when I span it and I am now weeping over it for my heart is faint with fear for you and India. Do not be afraid. I do not write to trouble you or to persuade you to give up your fast. What right have I even to ask you to live for loves sake? I had to wire for the little children, and I am sure all the children of India join in begging you to give up your fast and live for their sake. What have they done, poor innocent little ones, that this curse should fall on them? For if you die there is no future for India as a people. Therefore Bapu I beg with tears do not sacrifice your life except you are sure there is no hope for India. We who love you and are doing what we can and have suffered (sometimes I thought beyond endurance) for India, cannot and will not go on working for a lost cause. Ten times then better die! Continue your fast and prayer till India repents and allows God to create in her a new heart(?). And if she does not, she is not worthy to live. And we who have a life hidden in God, need not worry for our own sake. But this I beg of you, if you have still hope for India, suffer to live for her sake. Give up your fast when the doctor tells you that your strength is failing you. God strengthen you and us all and be with us in life or death. 1 Miss Petersen sent yarn spun by her. REACHING MADRAS SATURDAY MORNING "EN ROUTE" VYKOM. I was glad to have your letter. I know that if you did not write its is not for want of affection but it is because of affection. I have you often in my thoughts. Yes, Maganlals death is a heavy blow, if I am to consider this to be a Godless universe and we a purposeless creation; but when I realise that the hand of God is in everything, the grief itself turns to joy and gives me zest for greater service, greater dedication. I was delighted to receive your letter after such a long absence. It is not at all certain that I have launched on active politics. I do not know what part I have to play during the year. The next month will perhaps decide. You are needlessly anxious about my dietetic experiment. Believe me that experiment too is under Gods guidance as I understand it. You are quite right about the time-limit. Let us see what is in store for us at the end of the year. I am sorry that Esther is not yet quite restored. I knew about the operation for her appendicitis. Menon was expected to do no less than what he has been doing. However, I am glad that he has come up to the expectation. You have surmised well about the European visit. In 10 days I shall know definitely whether I am to go to Europe or not. But you are quite right. It would be only as a representative of free India that I should go to Europe. But here too Gods will be done. The Danish sisters are here. They have been here for the last 4 or 5 days. They are passing a week here at the Ashram. The Danish sisters were Cathinca Olsen and Ellen Hørup. I was delighted to hear from you after a long time. My collapse13 had nothing to do with my health. It was purely the welling up of emotion in me that overpowered me for the moment. This has happened to me more than once. I am keeping quite fit and there is no cause for anxiety. Do not stop writing for fear of taking up my time. Only don`t expect me always to reply. Had I gone to Europe I should certainly have sought out Esther and Menon.14 But God is great and merciful. At the right moment, he lifted the weight off my shoulders. Do not fear anything. Often we do not know what is good for us, or for our cause. When we are not driven by pride, but have surrendered ourselves to Him, then whatever happens, will be for the best. Sardar Vallabhbhai (Patel) is together with me. We are both happy and of good courage. Write whenever you want and have the opportunity. Anne Marie Petersen kommenterede Gandhis brev således: Thi Læser jeg hans Brev ret, saa er det en Opfordring til at holde hvad jeg lovede. Og, hidtil synes jeg, jeg har værert bundet til Skolen og Hjemmet her. Et Arbejde udadtil vil muligvis blive besvaret med Udvisning, Konfiskering og lukning af Skolen her. Det der angår min egen Person frygter jeg ingenlunde for, ja, det vilde muligvis være for det allerbedste som Bapu skriver. Men Missionens Gods synes jeg, jeg har en Forpligtigelse til unødvendig ikke at udsætte, og Skolen og Ashrammen er omend kun en Begyndelse og ikke noget stort saa dog et Frø der er begyndt at Spire og som der skal værnes om. Hvor skal de smaa gaa hen, som intet andet Hjem har, som Mannomany, f. Eks. Jeg vil derfor gerne høre fra Dr. Menon, om han kommer snart eller ej. Kommer han, da haaber jeg, vor Mission kan gøre en Indsats gennem ham. Kan jeg saa blive fri ved at finde en anden, der midlertidigt vil styre Skole og Hjem her, da viser Gud nok ogsaa mig Vejen til den Hjælp, som jeg kan være med til at bringe. Maaske den Tid netop nu er inde, hvor det er af betydning at alle Reserver sættes ind. Hvad det gælder om, er jo særlig Udholdenhed, saa vi kan synge som Sønderjyderne: "For de gamle som faldt, er der ny overalt. De skal møde, naar først der bliver kaldt". Hvad jeg lovede Bapu og Rajagopalchari, at vor mission skulde ofre, er et Folkehospital der, hvor dette tiltrænges mest her i Tamillandet. Vi vilde betale Lægens Løn og hjælpe saa langt vi kunde. Jeg havde da nærmest tænkt mig at Kongressen skulde betale Hospitalet. Men det er jo udelukket, da der ingen Kongres er, og alle dens Penge bliver Konfiskeret. Vor Mission kan da ikke gøre det hele, fattig og lille som den er. From: Indiens Venner, 1932 no 6 p 2. Thank you so much for your two loving letters, the last enclosing Esther’s. I am glad they are coming. I do need them. I am so tired that I hardly know how [to] go through these last few days and also I am afraid of the journey to Kashmir. I hope however that the stay there will help me, so that I can come back a new and better being and that with Menon’s help we can start some work amongst the poor and needy around us, also do something for the Harijans. It is good of you that you will see me on their account.2 It is more for the sake of what I wish to do, than what I am really doing. I have not even adopted the little Harijan girl I wanted to adopt in your name. None came as sent by God and I have not been able to go about seeking any. Also I am afraid of taking a new child when I am going away and giving all the responsibility to others. It is altogether a great responsibility and very difficult task to bring up children, and give them the right kind of education. What most they need is love – love that knows no bounds. I feel my shortcomings so keenly – especially when I am so tired as now when even their happy noise upsets me. But all visitors who have been here remark that the children are so full of joy and life. That is a comfort for me. And there are a great many children – especially girls who need a home and enough to eat and motherly love – even if they are sometimes too much for me. I will not miss one of those I have and I shall open my home and my heart for as many as I can, when I return from rest. There are so many things I long to talk to you about Bapu – mostly educational questions. I wonder whether you or Mahadev Desai3 ever got the book I sent him for Xmas. It was a book I though you would be interested in about “Education for Life” (The Danish Education, by an Irish woman, Noel Davis). I shall bring it to you when I come. But in order to be sure that I will be allowed an interview with you, I shall write today and ask the Superintendent4 permission. It would be too disappointing if I came to Poona and could not see you. Then I would rather go straight to Kashmir via Madras Delhi Frontier route and ask Maria Barr5 to join me in Delhi. I am glad she is coming with me. She is the sweetest girl and best companion one could think of. All here – teachers, servants, pupils – loved her. I really hope she will become a member of your ashram and do some good work there now when Ba and Mirabehn are not there. Don’t trouble to answer this letter. If I get a favourable reply from the Superintendent I shall come some day the first week of April. My very best regards to your companions and love to you. 2 Gandhi was in prison at that time. He was allowed visitors in connection with his movement for the service of Harijans (members of the so-called “untouchable” caste). I enclose herewith letter from Esther* which I have no doubt your will like and prize. We shall all look forward to their coming in autumn and it will be a great relief to me. Mary Barr wrote to me that she was likely to accompany you during your visit to Kashmir. I hope it is coming off and that it will do you good and give you a little bit of bracing air and rest to your tired limbs and mind. I hope you are getting your copy of the Harijan regularly. * The letter is missing. Then I had to try to explain myselves, and wrote a long letter, where I explaned, that I was not angry, but rather sad because he did not come hereto on his tour in the Tamil Nadu. And then I wrote, that I did my best to educate not only the Hindu children, but all the children and the young - because they are Indians - in Hinduism, i. e. in its literature; history; music; legends and songs. In this should be the right of this schools to the term national. Unfortunate it was all to little, we there had accomplished. I myselves could give nothing of personally effort. If I had the right assistants, then I whould held nothing against, that a Hindu taught in Hinduism and a Muslim in Islam. But it is one thing to educate in, another to witness about the way to blessedness and try to guide others onto this way. Only in the religion which was the thruth, the life and the way for us, could we guide others. What I did see of the life in his own Ashram witnesed about the same There the whole spirit was Hindu, and he is a missionary for Hinduism. Yes, they showed not even in their daily prayers so much consideration towards the Christians and Muslems, as we showed towards the Hindus. Our Father, I think could be a common prayer, regardless of the religion to which we belonged. - Jesus Christ was the life for me, was my everything; if I was unfaithful towards him, then I was lost; only about him I could witness; and never would I cease to pray for, that all, from the poor Paria to Mahatma Gandhi, may see his glory. It made me happy that you decided to send your letter. I like you even more after reading it. It is not for me to judge on the opinion, you have. We must accept, that we disagree in our interpretation. Of course you may love Jesus above everybody else, when you feel, as you do. I love all the teachers equal high, because I feel, as I do. You must continue to pray for, that I come to love Jesus, as you love him; and I may continue to pray for, that you may reach your true determination under the guidence of God. I wish you daily may grow in your faith, as I daily pray to grow in mine. I hope, that you are well. Love. Yes, come here to Wardha and bring your friend*. I am here the rest of the month. When they came, he was gone. I both can and will help. Not that I have money, I can call my own; and therefore you must let me know the least, you need to manage with . A buget is forwarded: We calculated, that the about 30 persons, including great and small, which our famely consisted of, could live for 200 Rupees; including the giving our poor pupils from without dinner. Reply missing. Before August 16, 1940 Mrs. Petersen recieves 200 Rupees from Gandhi. It makes me happy, that you now recieves help from Denmark. But be a little careful. Renember, it are gifts from others, we live by. Yes, I know your good heart, and that you have an open hand. Therefore I say: be carefull! But when you again are in trouble, then come to me. Bapu was very glad to have your letter of 3rd inst. He is sorry he cannot write to you himself as he has been forced to further curtail his work owing to overstrain. In fact he has almost reached the limit of his capacity and has had natures warning signals which he cannot ignore. He does not want to undertake a fast, but he is faced with a moral dilemma and he is praying to God for light. He will not undertake the fast unless he has the clearest indication that it is the will of God. I hope you had a favourable response from the trustees of the Kasturba Memorial Fund with regard to your proposal about your school. What you write about Ba is but too true. You will certainly come whenever you feel like coming. Your half angry and half loving letter. Why are you so foolish as to take what a third party says? Kasturba19 is a wholly non-sectarian organisation. Who was the third party who gave you to understand that only Hindus could apply? The thing has to come before me. It has not yet. If you have applied send me a copy of the application too. You know that Aryanayakum is a Christian? Raihana Tyabji is a trustee. So much for the Trust. When there is independence, why should you fear the majority? If you have God with you and the majority have not, should you still fear? And if both have God between them who should fear whom? Is there then any question of majority and minority? I have got all your papers now. I see that it is nobodys fault at the Centre. Anyway I am on the track now. You are foolish, so are we all, some more, some less. Therefore why worry? You must be well and live long enough to see your work flourish. Your application is under way. The Board meets some time this month when I hope the application will be finally considered. The ideal will be to find your expenses from the surroundings. We must strive to reach it. Of course you will see me in Madras when I come there. Have you fixed your date for the departure overseas? Send my love to Esther20 when you write to her and accept it for yourself. The enclosed21 is self-explanatory. Bapu wishes me to send it to you and would like a reply by return post as the matter of giving your institution help is coming up for consideration when the Trust Committee meets here on the 16th, 17th and 18th inst. I imagine there will be no difficulty in your giving an undertaking that if the K.M. Fund helps you with money you will consent to have at least one or two of its representatives on your governing body and that there will be nothing done in the way of conversions in the institution. I have read your letter to Rajkumari. I must say your letter is unsatisfactory. That you are going to Denmark and that during your absence the institution will remain closed should have been sufficient for the withdrawal of the application. Was it good or necessary to bring in the matter of conversion? When you and Esther came to me, it was, I think, common between us that conversion from one faith to another was needless and created heart-burning. Ones faith expands by removing the bad in it and absorbing the good and new from the others. You have every right to hold the opposite view. My point is simple. You had a decisive cause for withdrawing your application without raising an irrelevant issue. I hope you will have a good time in Denmark and will return hale and hearty. 1 Gandhi launched the nonviolent non-cooperation movement in August 1920 in protest against brutal repression in the Punjab and in defence of Turkey and the Caliphate (Khilafat) and thereby united Hindus and Muslims in a common struggle. The Indian National Congress endorsed the movement shortly after it was launched. 212 Speech on Non-cooperation, delivered at a public meeting in Madras beach on August 12, 1920. Collected Works, Volume 18, pages 143-54. 213 The non-cooperation movement involved boycott of government schools and the establishment of national schools. 14 Gandhiji had been invited to a World Student Conference in Helsinki. 17 Gandhiji was then in Yeravda Central Prison. 21 Letter from L.N. 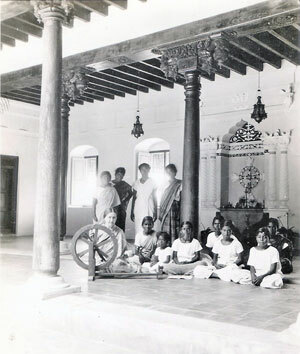 Gopalaswamy, Secretary, Tamil Nadu Provincial Committee of the Kasturba Trust, in which he had expressed the inability of the Trust to give financial help to Anne Marie Petersens ashram at Porto Novo.